Yesterday, I went shopping in a department store. I only planned to quickly run in to pick up a gift for a young lady I know who is getting married this fall. Literally, within five minutes of walking into the store, I had the gift in my hands. I immediately headed back to the front of the store to pay and leave. However, as I made my way to the register to check out, I passed by a large group of picture frames. Almost instantly, one of them caught my eye. I did a double take, blinked hard and stared. I might have even rubbed my eyes, trying to ensure I wasn’t seeing things. Reaching up to the top shelf, I gingerly picked up a frame, one that was obviously intended for Father’s Day gifting. At the top of the frame were the words “Me & Papa.” My father’s grandchildren all called him “Poppa” … we spelled it differently but pronounced it the same way. Still, it wasn’t the wording that had caught my attention. 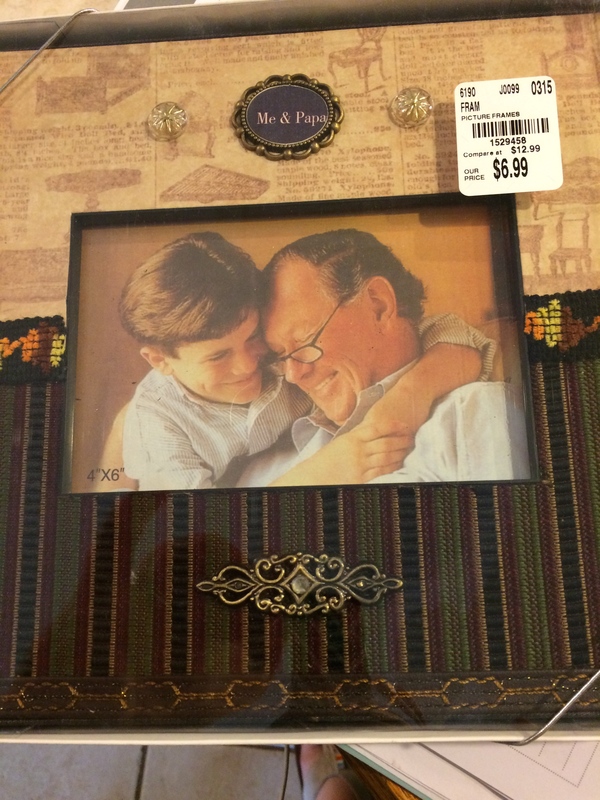 It was the sample photo that was displayed in the frame itself, a picture of a young boy and his grandfather. The man in the photo looked remarkably like my own Dad. In fact, it looked so much like him that it took me a minute to realize it wasn’t actually my father. For several long minutes, I stood there debating with myself about whether or not I should include the frame with my purchases. Seven dollars wasn’t that much money, yet I didn’t really have a picture I knew would be the perfect fit for the frame. The wording wasn’t quite right with Poppa not being spelled the way our family always spelled it. I continued arguing with the more frugal side of myself, pointing out that though the man in the frame looked like my father, he wasn’t really my dad. However, eventually emotions and sentimentality overruled frugality. I bought the frame. It’s sitting on my kitchen counter, still in the box with the price tag attached. I’ve never been a person to keep lots of framed photos around the house. There’s one of Jon and me at the top of Pike’s Peak sitting on the shelf above my kitchen sink. I have framed photo of my parents, an old black and white photo from when they were in college and dating. That one sits on the top of my piano, along with a couple of photos of my parents when they were children. And then there is the framed photo I pull out each Christmas, a snapshot of my dad holding me on my first Christmas. I’m barely 3 months old, and I’ve got a Santa hat on my head. I love that particular picture, and for years have always kept it displayed between Thanksgiving and New Year’s … although this past year I kept the photo out straight through Valentine’s Day. Somehow I couldn’t bear to pack it away again. Since Daddy died, photos of him mean a lot more to me. I don’t suppose that’s a unique feeling, as I imagine many people would say that photos become more cherished after a loved one passes. I’m grateful that I live in a day and age where we have photos to remind us of loved ones or special moments. In a sense, photographs are like connectors bringing the past forward into the present, capable of evoking a flood of emotions. At least that’s the way it’s been for me these past nine months. In fact, immediately following my father’s death, my emotions became extremely charged over photos … or rather, the lack of photos. When my Daddy died suddenly last September, I hastily packed to go be with my family. In just over four hours, I managed to get our two dogs ready to be boarded, found respite care for two foster babies, as well as got them packed and delivered to the respite provider, supervised the packing of my five teens and tweens, and still managed to pack suitcases for me and my husband. I never thought to bring along my box of childhood photos. Looking back, perhaps I should have though. It might have saved me some emotional pain. The next day at my father’s visitation, a photo slideshow was running continuously in the background. It was played again prior to the beginning of the funeral. Initially, as I watched the slideshow, I appreciated the sentimentality of the photos. But soon, I noticed something was amiss. There was not a single photo of me with my father. I couldn’t understand why I was missing from the slide show. The day before, someone had asked me if I had any photos of Dad with me or the kids on among my Facebook photos or saved on my cell phone. I found a couple of the kids with their grandfather, but none with me. I didn’t think much of it at the time. After all, I had no reason to suspect that no one else in the family would not have a single photo of me with my father? I tried not to let it get to me, yet the longer I watched, the more upset I became. It seemed like everyone else in the world was represented in the slide show, except for me. I was nowhere to be seen. There were photos of my father as a child, with both of his parents, and with all of his siblings. There were pictures of him doing a variety of activities from showing his 4-H lambs to posing with his basketball team to teaching school and coaching my brother’s baseball team. Naturally, there were many photographs of Daddy with my mother, from their dating days to their wedding day to a vacation they took to Hawaii before any of us children were born. The most recent photo was a picture of my parents taken just a week before his death. Both of my siblings were represented in the slide show, as were all of ten of the grandkids. There were photos of my dad with his nieces and nephews, several of his cousins, quite a few with church friends and even some of the students who had gone to the high school where he had been principal for many years. But not a single photo of me with Daddy. At the time, even though I felt forgotten, I knew the oversight wasn’t intentional. No one meant for me to be left out. But knowing that fact didn’t really take away the sting of being overlooked. Even now as I type this blog post, the memory of it causes tears to well up in the corners of my eyes and a lump to form in my throat. There are plenty of photos of me and my father together. These days I often pull them out and sift through them, looking at them to recall my Dad’s smile or eyes. The photos remind me of stories, events that took place long ago that I thought I’d all but forgotten until a picture reminds me and suddenly I am transported back in time. But I think perhaps there is more to my longing for photos than just wanting to see his face or remember the times we shared together. I think I want to recapture for myself what wasn’t honored at my father’s funeral. I want to remind myself that I was loved by my father, that I mattered to him, that I am not forgotten. I had a wonderful Daddy here on earth. He loved me, taught me, supported me, and encouraged me for 42 wonderful years. Even though he wasn’t perfect, I couldn’t have asked for a better father. But how much more wonderful is my Heavenly Father? How much more amazing is His love for me? Whenever I am reminded of that quote, I can’t help but smile. It’s something I definitely relate to as my own fridge is covered in photos and drawings made over the years by children I love. The faces held there by magnets are important to me, and whenever I pass by my refrigerator and see the smiles of the people I love, I am reminded to pray for them. You know, even though the sentiment about my photo being on God’s fridge is really sweet, it’s not exactly a truth I can hang my heart on when I’m feeling overlooked, forgotten or unseen. However, the Bible actually says something even better than God having my photo on his refrigerator. Look, I have inscribed you on the palms of My hands. God has me pictured on his hands! Not just my name … but my likeness. Doesn’t the thought of that just blow your mind? Think about it. I might not be on a heavenly refrigerator, but my very face is permanently inscribed on the hands of God. He always remembers me because my face is ever before Him. No photo in a frame or snapshot posted by magnet to the fridge or picture presented in a slide show of memories can begin to compare to that. I have been wondering if I should return it and get my money back. After all, what use to me is this frame? The image of the man in the frame isn’t my dad, and his name is spelled wrong. Certainly I could find a better way to display a photo of me with my father. But somehow, I think I’m going to keep this frame … as a reminder of my father’s love and that I am not forgotten. Because God always remembers me. My image in permanently imprinted on His Holy Hands. Aww Paige I am so sorry, my heart goes out to you, Even though your picture was missing I can feel the love God has shown you in your words and with finding the frame. 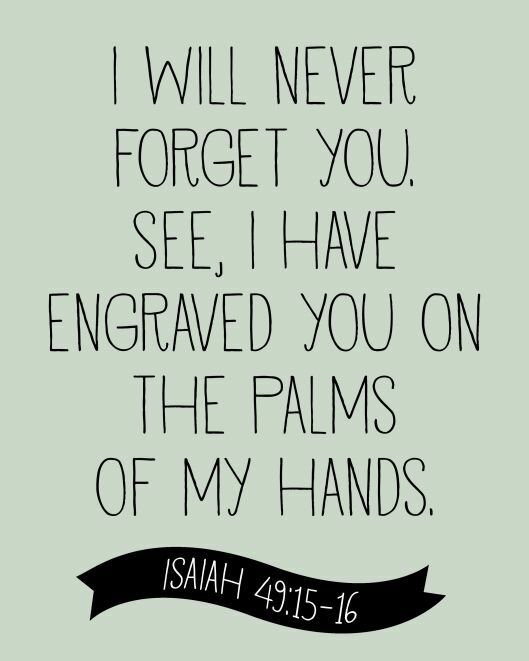 I also love the verse you shared…How awesome that God has our names engraved on the palms of his hands and you are so right nothing can compare to that! This was a very beautiful and powerful message.